The main ingredient in tahini, tiny sesame seeds add a wonderful, deep nutty flavour to many dishes. 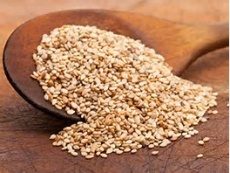 Sesame seeds are a very good source of copper, and a good source of magnesium and calcium. Sprinkle over steamed vegetables or combine with rice vinegar and soy sauce for a quick and tasty salad dressing!